Instream flows are a powerful tool to preserve essential river functions for people and wildlife while protecting existing water users. Instream flows act as a water right for the river itself, allocating a portion of the water to be preserved for habitat and river functionality. Establishing this base protection helps guarantee the longevity of our water resources and provides assurance that they will continue to bolster our economy and keep Washington uniquely beautiful indefinitely. The Center for Environmental Law and Policy is currently working towards adoption of instream flows in Southwest Washington. Due to a long history of shifting policies, impactful court decisions, and various watershed management proposals, there is much confusion regarding individual water rights and instream flows. Below are the answers to common instream flow questions. Q: What is an instream flow? A: An instream flow is a water right for the river. Like any other water right, the instream flow has a priority date and is entitled to water before more junior rights are satisfied. An instream flow does not put more water in the river, but it protects part or all of the water that is already there from further appropriations. Q: How will my existing water right be affected once an instream flow rule is adopted? What if the flow isn’t being met? A: It won’t. An instream flow is junior to any pre-existing water rights and can’t affect them. Even if the flow is not being met, water rights that predate the flow rule may use water. In fact, instream flows protect existing water rights because they ensure that the river won’t be further over-allocated. Q: How will an instream flow affect my permit-exempt well? A: It won’t. Like existing water rights, permit exempt wells that are in use before an instream flow rule is adopted are senior to the instream flow and immune from curtailment to protect that instream flow. Q: Once the instream flow rule is adopted, does that mean no new water will ever be given out? A: No. Establishing instream flows does not mean there is no opportunity to obtain new water rights for projects proposed after the flow rule. Interruptible water rights that are usable whenever flow levels exceed the instream flow can still be issued. There is also always the option to obtain a water right by mitigating use to avoid impacts on the instream flow. Q: Is my permit exempt well subject to curtailment from senior water users? A: It might be. Just like any other water right, permit-exempt wells are subject to prior appropriation and can be curtailed to protect senior water users. 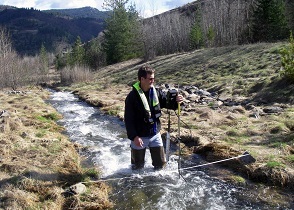 Watersheds to Watch is a blog series produced by CELP on unprotected watersheds in Washington. Read on for more information about your local Water Resource Inventory Area (WRIA) and make sure to check our blog for new posts! If you would like to keep your local rivers healthy, or would like to share information about your river, we would love to hear from you. Water affects all walks of life, and preserving our fishing, recreational, economic, and aesthetic resources has never been more important. Any information you can share about the health of your local rivers or streams, or your perspective on their protection, is hugely valuable. Please also follow the links below for more information on specific watersheds. For more information, to get involved, or to tell your river’s story, contact Nick Manning at nmanning@celp.org.